Set on an infinite stretch of neon colored 2D road, your mission in this game is to wave your way past and around glowing 2D obstacles (or enemies) that look just like your player and spawn at random intervals along the stage. 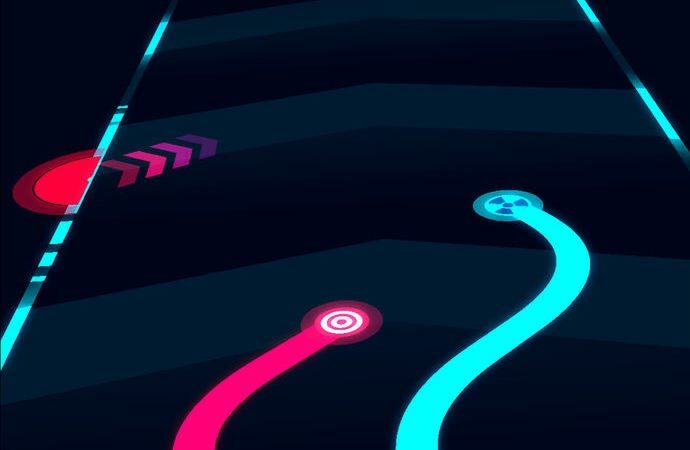 Played by tapping on the screen of your device in order to switch the direction in which your player moves, Wavy Lines is virtually all about taking risks – and avoiding a bunch of snake-like obstacles that look and move just like your player. Your goal is to survive for as long as possible and to make it to a new high score, and we’re telling you – it is super hard! By default, your player moves faster than your opponents, so there is no fear of suddenly getting attacked from behind – in fact, if any enemies bump into your trail they die. That having been said, it often isn’t enough to simply avoid them, since they will more often than not get in the way of the boosters that make playing this game much easier. To get rid of enemies faster, your only option is to stick close beside an enemy for a given amount of time without colliding in order to activate a short invincibility boost which allows you to smash through your opponents and make it to a new high score! Unfortunately, this is super hard to do without messing up and “accidentally” hurling your phone across the room in frustration! This game is tool haaardddddd!!!!! Well, playing A LOT of games would probably help, but don’t you find the wavy obstacles sometimes move in a way that seems physically impossible to avoid? Oh, Yes! While you’re still there! I’ve got a game I would like you guys to check out! Can you take a look at Snowball.io? It’s super fun! Sure we can! I actually thought we had already done that one… Seems we hadn’t!